SNP School 2013 was successfully finished. Link to pictures is in the lecture notes page. 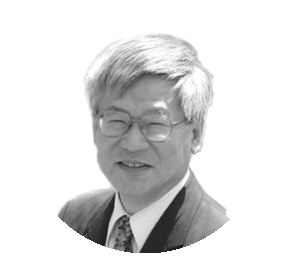 Prof. Osamu Hashimoto (1947-2012) who is the first chair of the SNP School and devoted his efforts not only to research, administration works but also to encourage of young students. Congraturations to Yohei, Jia-Chii, Natalie and Anna. on Innovative Areas "Nuclear matter in neutron stars investigated by experiments and astronomical observations". Please check the above web page occasionally to have latest information. A series of lectures and topical talks will be given by distinguished physicists from around the world. Tentative titles of lectures and schedule are provided below. PDF version of the program is here. 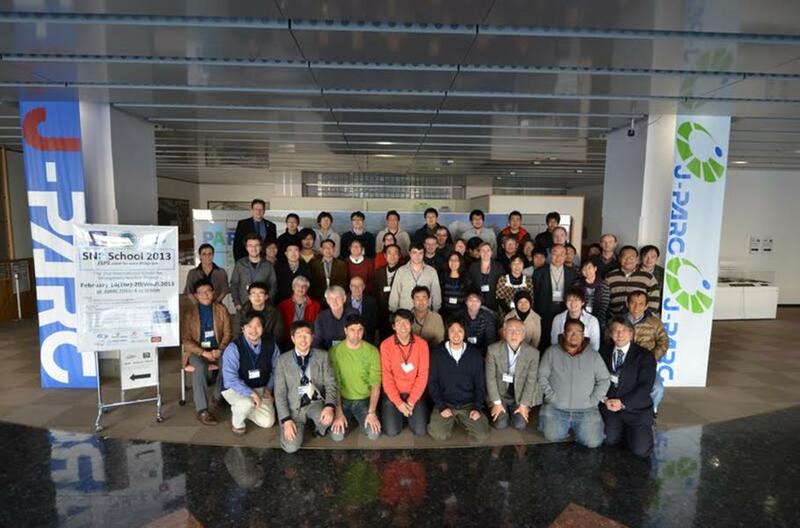 The first half of the school (February 12-15) will be held at the IBARAKI Quantum Beam Research Center (IQBRC) near the J-PARC Tokai campus (Tokai, JAPAN). 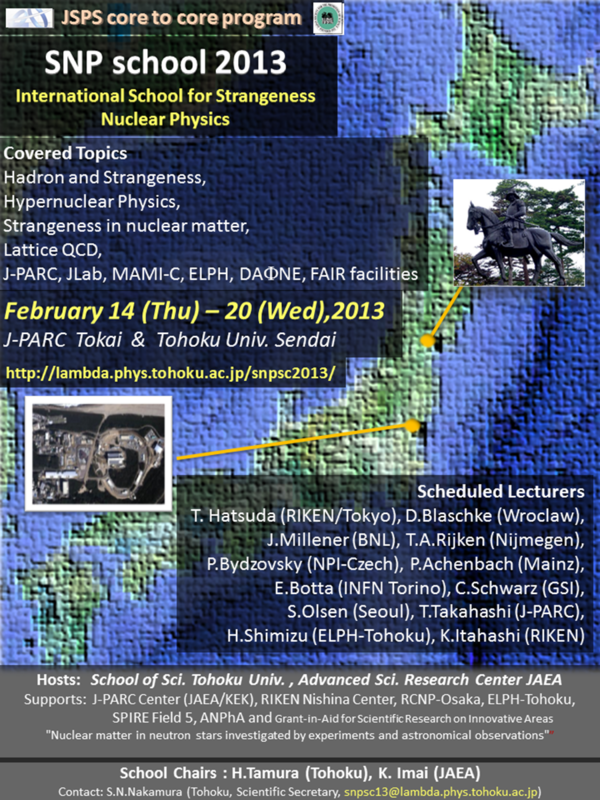 The latter half (February 15-18) of the school will be held on the Kawauchi campus, Tohoku University (Sendai, JAPAN). The organizers will arrange bus transportation from Tokai to Sendai on the 15th for the school participants. Here is your survival guide. It includes a mobile phone number of the organizer and Japanese sentences in case of need. Afternoon of 15th Feb., all participants are expected to join the J-PARC site tour. Material Life science Facility (MLF), Central Control Room (CCR) , neutrino facility and the Hadron Hall will be toured. All foreign passport holders should fill the Visit Proposal and send it to the organizer before the tour. Registration desk will open from 9:00 on 14th February at IQBRC. Please prepare 15,000 Yen (Cash only). Please pay for Ichinobo (hotel at Sakunami) at the registration desk at the same time, 10,000 Yen (Cash only). Other hotels at Katsuta and Sendai are booked by the organizers, but you should adjust balance by yourself at the hotel. The hotels will accept major credit cards. Those who have support will be reimbursed later. All young researchers are expected to present their posters. Program of Young researchers’ Session is here. Maximum size of the poster is A0 (841mm x 1189mm). Please bring the printed poster to the school. The organizer cannot print your poster at the school site. Chance of oral presentation will be given for selected presentations (Young researchers’ session, 16th afternoon). Hashimoto prize will be awarded to the best presentation and poster. All young researchers are requested to submit 1-page report of your impression on the SNP school 2013 before the summary and closing session. Selected students will present the report in the summary and closing session at Sakunami. If your talk is assigned as an oral presentation, please prepare your talk for 12min + 3min (Q&A). There is no time to swap your laptops during the young researcher's session. Only organizer's laptop will be used for the presentation. Please give the ppt or pdf file to the organizer before noon of 14th Feb. Your hotel assignment is here. Please check it carefully. if anything is wrong, please contact to the organizer as soon as possible. The hotel rooms will be released after the circulation of this final announcement. The organizers pre-booked 50 rooms at the Hotel Crystal Palace (marked as "C" on the hotel assignment page) located 2 km from JR-Katsuta station. Room price including breakfast is 7,350-8,400 yen per person per night (price varies depending on room type.) Major credit cards will be accepted. Around J-PARC and IQBRC, a few restaurants are available and the organizers will prepare the lunch (included in the registration fee) on the 13th and the 14th. Around the hotel or Katsuta station, you can easily find a restaurant for dinner with this restaurant map. At Sendai, rooms are booked at Pearl-City hotel which are within walking distance from the Kawauchi campus, Tohoku Univ. (Public bus is also available). Room price including breakfast is 6,000-7,000 yen per person per night. Major credit cards will be accepted. In Sendai, there are many hotels and restaurants and the organizer will not arrange lunch. The organizers will provide information of surrounding restaurants located in the vicinity of the school site. Campus cafeteria serves food with a reasonable price. In the evening of the 20th, we will have a summary and closing session at a Japanese traditional hotel (“Ryokan Ichinobo”) in the Sakunami hot spring area which is located about 20km west of Sendai urban district. We are planning to award school completion certificate to students there. After the summary and closing session, we will have school dinner there. We will enjoy discussion at the hot spring and shared Tatami rooms. Room charge (not included in the registration fee) will be collected at the registration desk (10,000 yen per person, only by cash ). We will visit the World Heritage, NIKKO as an excursion. The organizer booked participants’ rooms at the Hotel Crystal Palace located 2 km from the JR-Katsuta station (30min walk or 7 min by taxi). Here is a detailed instruction how you can reach to the hotel after arrival at Katsuta station by the Rose Liner. It takes 15 minutes between Katsuta station and Tokai station by the JR-Joban-line. Another 15 minutes taxi trip will bring you from the Tokai station (west exit) to the school site, IQBRC. The organizers will arrange a direct bus from the hotel to the school site in the morning (8:15 on 14th, 15th and 16th) and a return bus from the school to the hotel after the session in the evening. Bus schedule is also shown on the lecture program. On the 17th, bus transportation from Tokai to Sendai with a lunch will be arranged by the organizers. In Sendai, 40 rooms are booked at the Pearl-City hotel which is walking distance from the Kawauchi campus, Tohoku Univ. (Public bus is also available). Hotels and Kawauchi campus are located in the central Sendai area and public transportation is well organized. In the evening of the 20th, participants will move from the school site to ELPH-Tohoku facility after the morning lecture. One lecture will be given at ELPH and tour for the ELPH accelerator will be organized. A transportation from ELPH to Sakunami hot-spring by a bus arranged by the organizers. We will have a summary talk and a school dinner there and enjoy discussion at the hot spring. School will be closed on late night of 20th and participants will enjoy staying at the hot-spring. It will take 40 minutes from Sakunami to the JR Sendai station by JR-Senzan-line. From the Sendai station to the Narita International Airport, it is a two hours trip by Shinkansen (super-express) and one hour by train (Keisei or JR) to the Narita airport station. For those who take a flight to the Narita airport from Sendai, the Sendai International airport can be reached in 30 minutes from the JR Sendai station by the Sendai-Access-Line. If you take an early flight in the morning usually around 8 a.m. to Narita ), please ask for assistance in advance. The Tokai village, in which J-PARC has been constructed (at the Tokai site of Japan Atomic Energy Agency, JAEA), is located at 100km northeast of Tokyo and 70km north of the Tokyo-Narita International Airport. The village faces the Pacific Ocean. Tokai is adjacent to Mito City (local government office exists), which is the largest city in Ibaraki Prefecture and has many historic spots. Both Tokai, Mito and Tsukuba (where KEK exists) belong to Ibaraki Prefecture; Tokyo-Narita International Airport belongs to Chiba Prefecture located the south of Ibaraki. The average temperature in February is about 3 degrees C, and daily minimum/maximum temperatures are about -5 to 10 degrees C with occasional snowfall. The city of Sendai with a population of one million is the center of the northern part of Japan, Tohoku District. It is located about 350 km north of Tokyo and can be reached in 2 hours with a super-express train (Tohoku Shinkansen). The city features an abundance of natural beauty that changes with the seasons. Sendai is nicknamed "Mori no miyako" (literally city of green), which illustrates this perfectly. The city has a rich cultural heritage stretching back 400 years to its founding by feudal lord Date Masamune. The city is surrounded by mountains and Pacific ocean, making its weather reasonably mild. Average temperature at Sendai in February is 4 degrees C (39F), daily minimum/maximum temperatures are -2 /6 degrees C. Though heavy snow fall is rare in Sendai, it is necessary to be prepared for snow in February. We recommend you to bring warm clothing with coat. Further information on the city is found in the following WEB pages. Tohoku University adopts total campus wide bans on smoking. If you want to smoke during the school, you need bring your potable ashtray and go out of the campus during the breaks.